Catching the eye becomes a top priority for accessory manufacturers, especially those that produce messenger bags. These versatile bags flood the marketplace for good reason: Most make a good case for being your everyday commute-to-work bag. A certain type of consumer (like me) will use a messenger bag or backpack until something else catches the eye. As I’ve mentioned in past reviews, I don’t judge my wife’s closet full of purses. But in striking two nerves — the needs for style and function — the Nerve Black looks likely to stay on your shoulder beyond the typical honeymoon period. Waterproof materials, discreet fasteners and a generous amount of Velcro will keep your gear secure. The Black is an upgrade from the booq Boa Nerve (released in 2014), which boasted the same durable ballistic nylon minus the tarpaulin surfaces. The Nerve Black’s handsome flap is thick and feels storm-proof. A waterproof, vertical pocket on the flap is one of five zippered compartments, each offering space for various items. Two on the back open to create a trolley pass you can secure to telescoping handles on luggage carts. In case you enjoy the ripping sound of Velcro, the Nerve incorporates thick strips on the flap’s underside. 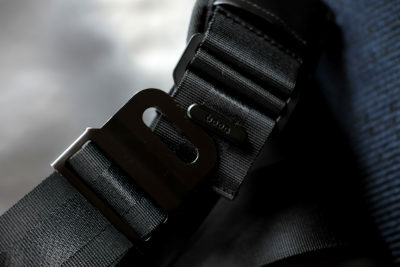 Even if you decide not to fasten the plastic clips on the bottom edge of the flap, the generous amount of Velcro will secure the bag’s closure. Once open, there’s more tarpaulin for weatherproofing along with two stealthy zippered pockets on the top and side. The Nerve Black offers two roomy and well-padded main compartments. Two densely padded compartments protect your gear from abuse. One of them can safely hold a 15-inch MacBook or 16-inch laptop. In front of it, you’ll find another cushy pouch along with two pockets for accessories like pens, notebooks, a mouse or any other small essentials. The padded strap, made of seatbelt-grade nylon with a magnetic-release clasp for quick adjustment, feels comfortable on the shoulder. A stabilizer strap makes things easier for cyclists. A magnetic clasp on the Nerve lets the user make quick adjustments. 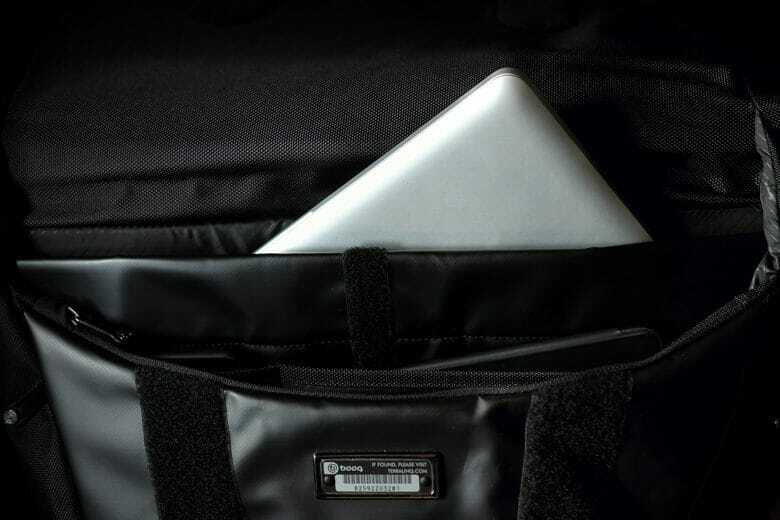 Common features show up across booq’s wide variety of shoulder bags and backpacks. These features, such as familiar shapes and lines to accommodate discreet zippered pockets, turn up over and over. The dark colors of booq’s materials, especially black, skew masculine. 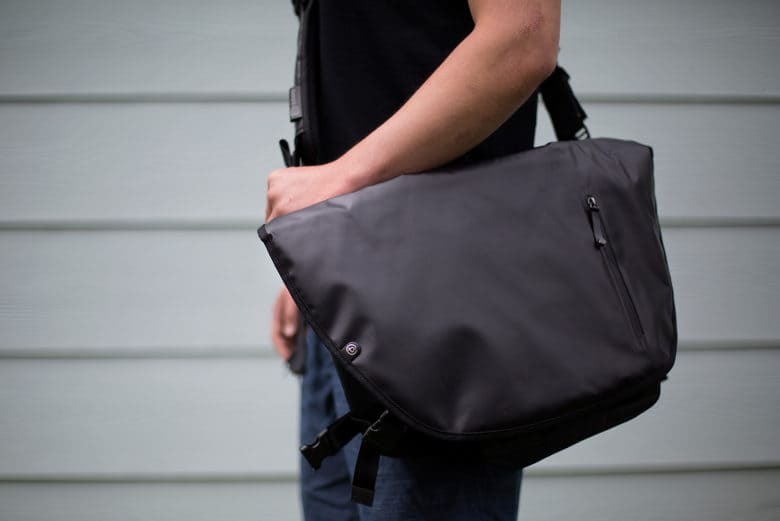 The Nerve Black (or a number of booq’s other bags) might not work for those desiring a more colorful carry. But the recurring features, to me, signal a firm belief in a low profile and a high expectation of functionality, no matter the size or shape of the product. Cult of Mac received a review unit from booq for this review. Read Cult of Mac’s reviews policy.